The objective of this paper is to conduct a preliminary analysis of the governance of the oil and gas sector among Arab net oil exporters. 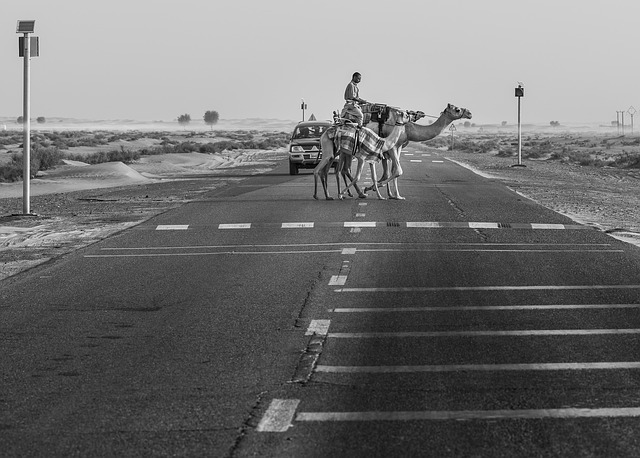 Although a lot of research has been done on the resource curse, by comparison, little work has been carried out at the sectoral level and across various aspects of the oil and gas value chain, especially in the Arab region, despite it being the largest oil and gas producer in the world. A research such as this would reveal whether fundamental flaws can be identified at the sector level which may be prohibiting the oil exporters from translating their wealth into sustainable development. Nine Arab net oil exporters were selected, namely: Algeria, Bahrain, Iraq, Kuwait, Libya, Oman, Qatar, Saudi Arabia and the UAE. Norway was used as the benchmark. Although international comparisons should be treated with caution given varying domestic conditions and history, a meaningful comparison is typically carried out using a good benchmark. In this respect, Norway was chosen because its management of the oil and gas sector is typically seen as exemplary and the country scores high on various governance indicators. While some countries score better than others on the sustainability and governance indicators, they all still have a long way to go. The comparison of the management strategies of each of the five pillars of the value chain – mainly: the award of contracts and licenses, regulations, fiscal regime, revenue management and sustainable development, reveals many commonalities between the Arab net oil exporters and significant divergences from Norway. 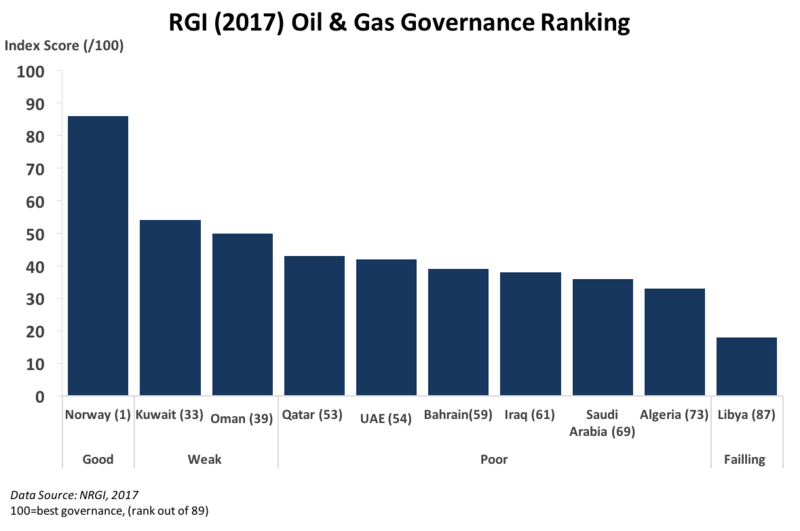 Using governance indicators such as the RGI, Norway clearly outperforms every single Arab net oil exporter, particularly on the completeness of the petroleum system, clarity around the division of roles and responsibilities of relevant institutions, transparency of the fiscal terms and effective management of the oil proceeds, among others. Even on the only indicator where Norway does not fare well as per the governance indicators, and which relates to the allocation of license given the country’s use of administrative procedure, the difference remains notable with the other selected countries. The only exception where one Arab country outperforms Norway is Bahrain with respect to gas flaring simply because Bahrain is a much smaller oil and gas producer. The findings of this paper can partly explain why the progress of the Arab net oil exporters towards achieving the SDGs agenda is not satisfactory. While some countries score better than others, they all still have a long way to go, which is not going to be easy or cheap and requires dedication and commitment of their leaders. Probably the key finding that can encapsulate all the main observations of this study and that is the most recurring feature throughout the comparative analysis, is the limited transparency surrounding the management of the oil and gas sector in the Arab region particularly as compared to Norway. For the latter, all the information and data used to carry out the analysis was easily accessible from the government’s dedicated websites. For the Arab region, however, collecting such information was very challenging, and, despite the effort, some data could not be collected thereby limiting the ability to conduct a comprehensive assessment. For practical reasons, the paper did not capture all the factors that have affected the management of the oil and gas sector in the selected countries, particularly the political economy dimension, which can be a valuable area to research at length. The paper provides an initial assessment of the management of the oil and gas sector in the Arab region, and hopes to support future work on an individual country basis as well as on the concept of good governance of oil and gas, which remains work in progress. Those with more insights into the inner workings of the oil and gas sector in the Arab countries may dispute some of the findings of this paper. They may be right. However, since this study is based on what is publicly available, its conclusion will continue to hold until additional information is revealed.